Yep, I sure would, but only on one condition. If I’d had time to get to know him, and discovered that he is not to be the charlatan he appears to be because of that awful jacket, but a thoughtful guy, willing to inform, educate and entertain me in the belief that one day, we might do business together. 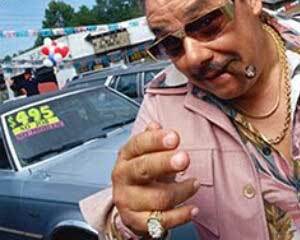 Then I’d be delighted to buy a car from him. Sales today is about respect; something we earn, over time, and content marketing is a great way to create it. But how do we write content that way? Think about what your readers want to know, and treat that information “right” — honest, balanced and, importantly, entertaining. The trust is the wouldn’t be listening to Redding’s lyrics, however brilliant, if Franklin’s delivery hadn’t brought them so vividly to life. That is the crucial point – don’t make your content a monologue; make it a dialogue with the reader in your mind. You know them, after all, because you have a product or service that some of them, at least, love and buy from you. And then you will find the conversation becomes real, as they retweet and comment on your posts. I’m glad that we are reaching the end of the pushy sales era, and into the content marketing era. When I pull out my credit card, I want to hand my cash over to someone that I respect — a generous, honest person, who has shown in lots of ways that they respect me.